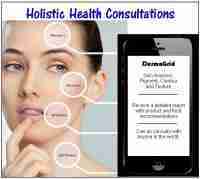 Home / Shop / Consultations / Holistic Health Consultation With DermaGrid Scan, 60min. Holistic Health Consultation With DermaGrid Scan, 60min. Holistic Health Consultation with Certified Clinical Aromatherapist & Herbalist, Jennifer Hochell Pressimone. A 60-minute private consultation includes a Client Intake Assessment, DermaGrid Scan (remote technology for anyone in the world) and Customized Natural Health Program. These consultations are conducted via telephone, or skype. By appointment only. Sometimes we feel like there is a million things going on, when in actuality, the culprits can be narrowed down to a couple body system imbalances. I help you play investigator so together, we can uncover the root causes and sources of the imbalances to create a personalized herbal and aromatherapy program to get you back on track. I have been helping myself and others for 20 years combining my personal health and research experiences with my psychology, aromatic and business background, coupled with my caring and compassionate nature. I believe my life was spared so I can pay forward the lessons I’ve learned and gifts I’ve developed along the way. It’s time to focus on you! Pay now to book your Holistic Health Consultation. Complete the DermaGrid Client Intake Form when you purchase your Consultation.